When I first started photography, I actually didn’t tell very many people. Obviously my close friends knew, since I was constantly toting the camera to every get-together we had, and my immediate family also had a big hand in my photography beginning, so they were pretty aware also. But as far as posting my photos to facebook, talking about photography, or even reaching out to other photographers I already knew, I was exceptionally timid. EXCEPTIONALLY. I was MORTIFIED for seasoned photographers to even find out I was trying it. Part of it was because through all of the research I’d done about photography in general and the few run-ins I’d had WITH photographers left me with the feeling that the topic and practice of photography was reserved for the elite alone (before I go further: obviously at that point I hadn’t met many photographers, because my opinion now has changed- there ARE those who badmouth amateurs and are just all around snobs, but I’ve recently encountered many helpful photographers who are happy to give advice and inspiration to beginners). I’d read a lot of exceptionally negative comments from the pros about amateurs getting their hands on DSLRs and ruining the art for everyone. These types of things sent me into a pretty significant feeling of hopelessness for a short time… how could I, one who DESPERATELY wants to increase my skills so I can express myself artistically and creatively even have a chance at making it, if there was no starting point? It felt that if you hadn’t been in the PROFESSIONAL photography business for 25 years, you might as well hang up the camera and resign to a life of the 9-5. Oh, and don’t even bother TRYING to have a creative outlet, because no body cares about what you’re doing. One of my best friends, who is also named Katie, is also a photographer. She’s good. Very good. For some reason, I was even timid about showing her my work for a while, even though I’ve never received one fraction of an ounce of judgement from this girl. As a matter of fact, she’s always been one of the most supportive friends I’ve ever had. Luckily I happened to let a comment about my camera slip at one point, and she was ever so inviting, excited even! We had YET ANOTHER thing in common (among the many we’ve shared over the past 8 years.. WAIT! 8 YEARS?! My goodness, time flies..) We went out shooting at night one night, and I had so much fun. DYING to go shooting with her again. Sadly she lives in a different town and is very busy with work. I’m actually going to “rabbit trail” a bit here because I feel the need to explain how wonderful Other Katie is. Katie is pretty quiet (unless we’re being crazy). She’s one of the deep, introspective types, who just radiates intelligence and nurture. She has just graduated from nursing school. Which is no surprise to me. She is by far the most caring person I’ve ever met in my life, and that is no exaggeration. She has a heart of gold. She recently told me that what she would like to do with her life is to become a traveling nurse, and to take amazing photos during her travels. She would then like to sell those photos and donate the profits to charities that would go along with her nursing work. See what I mean? She’s so full of love and empathy, selflessness and understanding. Everything she does, she does it out of love for others, and that is what makes her such a beautiful person. Aside from the fact that she’s just gorgeous to begin with 😀 Okay, rabbit trail ended. I’ve actually always been timid about my artwork. I used to make myself sick over the thought of getting my paintings and drawings out there. I’ve never even attempted to be featured in a gallery, no matter how small the show is, because I just don’t think I’d be accepted. Or if I was accepted somehow, I always thought it just wouldn’t go over well. Especially displayed with other artists’ work! I’d frankly end up with ulcers until the showing was over with. One exception was when I was working as a barista at Starbucks. For one reason or another, our manager asked all of the baristas to bring in whatever artwork they had created to display on an empty wall. 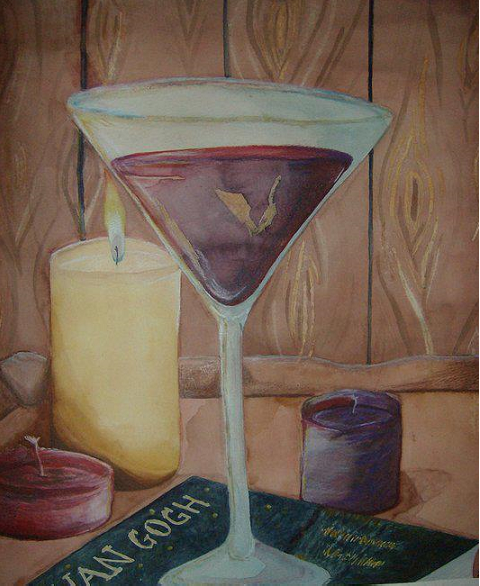 I happened to have painted a somewhat large watercolor painting of a martini glass sitting on top of a coffee table book of van Gogh paintings, with a few candles around. Probably my favorite watercolor I’ve done to date, so I wasn’t too ashamed. And I’ve mostly come out of the fear of getting out there, as far as painting goes. Still working on kicking the photography vulnerability. Anyway, a close friend of mine at that time was getting ready to go on a 4 month tour with his band in Australia, and he’d offered me around $100 for it any time he’d see it. Well, I didn’t want to charge him, but I wanted him to have the painting, so I gave it to him as a gift before he left. Wonder if he still has it? Anyway, totally not the point of my rant. The painting I was referring to. In retrospect, a glass of absinthe would have been much more appropriate, but you couldn’t buy absinthe in the US at that time and I never really considered using food coloring. Couldn’t have gotten the cloudy look anyway with that… Actually, the friend who ended up owning this used to import absinthe from New Zealand on a frequent basis. Random, relevant memory.. I actually still have the table I used as a model for the table everything is sitting on. Still have the van Gogh book too… although the cover was actually ruined by candle wax in the process of painting this. It took me about 2 months from start to finish, and the lit candle had to be replaced a few times because it kept burning down. I’ve heard that a lot of artists feel that way about their work. It’s something that comes from inside us, something we’ve poured our souls into, and therefore makes us vulnerable when an outsider is invited to give his opinion of that little piece of ourselves. To an unstable artist, a mere critique can send one spiraling into self-doubt. Heck, that can happen with a stable artist sometimes, depending on who the critique is coming from. Anyway, coupling the natural vulnerability of an artist and his (or her, in my case) art form with the fact that he or she is a beginner IN that art form can create a whole new level of inadequate feelings. “Are people going to laugh at me?”, “What is that amazing photographer over there going to think about my work? Will she be annoyed that I’m disgracing her art form? Secretly think to himself that I’m kidding myself?”, “Am I trying too hard??? IS IT OBVIOUS THAT I’M TRYING TO HARD?? ?”, “WHEN will I actually get good enough at this to not feel like an idiot?”… If you’re an artist of any kind, I’m sure you’ve experienced these feelings. The funny thing is, I have yet to meet an artist of any medium who comes across as vulnerable and timid as I feel. I’m sure it’s all in perception though. I know myself and what I feel much more than anyone else knows me. All around me I see these proud, strong artists, loudly proclaiming to the world how wonderful they are. And they should! Because how else will anyone pay attention to you? This is what I’m learning from them. A perfect example of the proud, strong, talented, and very willing to help out is someone I actually have never met, but definitely admire: Alex Beadon. Somehow I stumbled across her youtube channel, Chatty Tuesdays, and was just hooked. She is feminine, beautiful, proud, talented, and an absolute marketing genius. She actually spends a large part of her time preparing videos and help for photographers and small business owners. She’ll answer tough questions with the knowledge of guru and makes things seem so unbelievably simple. I definitely suggest checking her out. While her videos tend to be targeted to business WOMEN, I know that she has a large male audience as well. My husband is even pretty hooked on her videos! Another recent thing that was exceptionally uplifting for me. I found a professional photographer’s info site called http://www.takeoffyourmommygoggles.com/. There is a wealth of information packed into that website. There are so many things addressed that I have had questions about but could never find answers. And it gives me- an amateur wanting to go pro- something to live up to when I finally get my business set in place. During my low, vulnerable period, I sent a contact message to the girl running the website, basically just asking for advice on where to start. This took a lot of guts for me. I’m definitely able to be humbled. I’m never stopped from asking for advice because I think I’m above it- quite the opposite, actually. If I’m afraid to ask for advice, it’s because I KNOW I need the advice, and I basically feel unworthy of receiving it. I assume the guru won’t want to help a little nothing such as I. So lately I’ve been learning to swallow that fear and just reach out. And in this case, I’m so glad I did! I received a very personal, sweet message back from Heather, the girl who writes the articles for the page. She was so very encouraging, and so unbelievably willing to help out. The fact that a professional whom I’ve never met was so willing to give her words of advice to an admitting amateur lifted my spirits so high, and now I have even MORE respect for her, and for the website she runs. I definitely plan on frequenting her website! I’ve also been exceptionally inspired and uplifted by some local photographer friends I have. Katie being one of them, and a couple other friends as well. Of course I’ve mentioned my dad… he’s the biggest reason why I’m interested in photography. He’s so willing to help me with anything I may have a question about- and if he doesn’t know the answer, he tends to help me search it out. And every time I ask to borrow an external flash or one of his lenses, he’s always quick to offer the use of his camera as well. And one more source of inspiration I’ve recently found- Blogging! I started this blog to give myself a linear way to track my progress. I want to be able to look back to right now in a year, two years, five even, and to be able to see how far I’ve come. But in the process, I’ve also found that there are many photographers willing to offer encouragement, discuss, share tips and stories, and even just “like” my posts, however insignificant they may be. As little as it may seem to them.. just a click of a button in many cases.. it means a world to me. It gives me reason to force myself out of my vulnerable shell, to open up, feel a bit more confident, and hopefully grow in the process. So, thank you, fellow bloggers. You also have a part in my journey to finding myself through my photography. I may never know you personally, but the trade of information, encouragement, and your presence leaves a sense of inspiration, and keeps me truckin’. Anyone else feel this way? Please feel free to share with me! I’d love to hear your story. You are a very beautiful and talented young lady. Thank you for being so transparent. Mom?!? Haha Thank you 🙂 I’ve been discovering that the only way to stop feeling that way is to reject the feeling and put it out there anyway. If I disapprove of myself, I hold myself back. I love you! And thank you for always being supportive of me. Wow, I can’t believe how incredibly similar our feelings towards our art are/have been (except replace photography with painting in my case). I have, without a doubt, experienced every single one of those emotions. The vulnerability…the fear that people will laugh at me…right down to not wanting to take money from friends for a painting and just waiting for an occasion to gift it to them. Any time I actually sell a painting, I’m first of all shocked that someone just wants to hang it up in their home for the world to see, let alone actually give me money for it! I love this post. I hope more emerging or “closet” artists find the courage to own their talent and showcase it to the world without fear. I know I’m working on it and have come a really really long way, but I’d by lying if I said those thoughts are entirely gone. But do they ever go away, or do we just get better at putting up a front? I was thinking just the same thing when I was reading one of your posts! And believe me! I went through that with painting too. But since I’d been painting much longer than taking photos, I’ve FINALLY FINALLY realized that there ARE people out there who are willing and even WANT to own a piece of my artwork. It took a while, that’s for sure. But I can’t explain to you the excitement I had when I found some of my art on a random website, and read all of the comments. Sure, there were a few negative. But they weren’t that bad, and I didn’t let it get me down, because the positive feedback was just overwhelming! And even after somewhat beating the vulnerability in painting, I still swell with those exact emotions you described! Really? You wanna… pay me?? Like… REAL MONEY?? I really believe that we’ll have to continuously work at putting ourselves out there. It can be exhausting, stressful, and terribly revealing- as I mentioned, we are bearing little pieces of ourselves, standing unhidden for the world to place judgement (whether it be good or bad judgement)- but it is so very very worth it, because not only with the act of putting yourself out there strengthen you, so will the realization that your work is being accepted- loved, even. Sure, it might be quite the front for quite a while, and even though it may never completely evolve into pure confidence, I think it becomes easier to swallow the feelings of “what kind of negative feedback will I get? ?” if we instead look at it as “if I DON’T put myself out there, how will I know if I will get positive feedback?” Because I feel like the knowledge that you truly touched someone and made a POSITIVE impact on them with those little bits of your soul is the best reward in the world. I am so thrilled for you that you are also working on this very thing with yourself! You are an unbelievably talented and very beautiful woman, and I can SEE the feeling you pour into your art.. And I don’t even know you. Just remember that. I know it can be difficult, especially if you’re like me and fall into the feeling that showing confidence may interpret to others as being self-absorbed.. It is NOT. It is who you are, and you should be so proud to be who you are. Much love and luck to you on your journey too! I’m so excited to keep reading your wonderfully inspirational blog!